Apple has shown interest in building a new universal power adapter compatible with different DC voltage levels, allowing portable devices like a MacBook Pro, iPhone and iPad to be charged at the same time with just one wall plug. The proposed invention was revealed this week in a new Apple patent application filed with the U.S. Patent and Trademark Office and discovered by AppleInsider. The filing, entitled "Multi-Output Power Supply," notes that most commercially available adapters do not include multiple outputs for supplying different DC voltage levels. "As such, users may often purchase a device-specific adapter for powering a device," it states. "However, this requires that the user carry a separate adapter for each device, which can be cumbersome when a user is traveling, as many users forget to bring all of the associated adapters required for various devices." Those adapters can also be relatively bulky, Apple notes, making them less than ideal to carry while traveling. The company also said that it can be confusing to users when multiple adapters are at use in a stationary location, like a home or office. 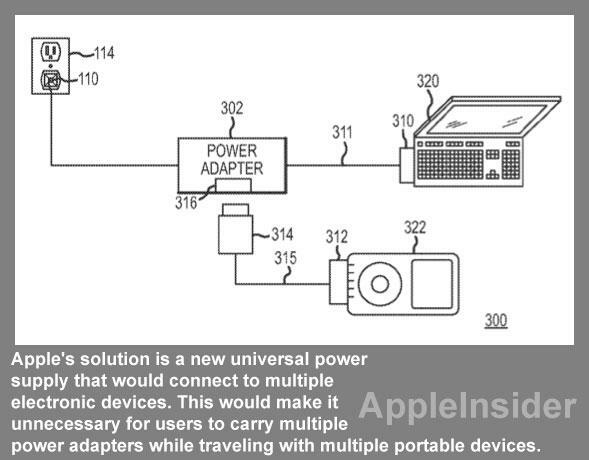 Apple's solution is a new universal power supply that would connect to multiple electronic devices. This would make it unnecessary for users to carry multiple power adapters while traveling with multiple portable devices. The filing describes a single power adapter that includes a DC-to-DC converter, allowing it to meet the different voltage requirements of unique devices. The adapter could also intelligently control power supplied through its outlets to ensure that the correct voltage is sent out to appropriate devices. In addition to iPods, iPhones and iPads, the application specifically notes that such a system could also be compatible with Apple's patented MagSafe technology, used to supply power to the company's MacBook line of notebooks. The charging cable could include a power "brick" similar to the ones currently used with a MacBook Pro or MacBook Air. That brick would include the necessary voltage converter, and could allow another portable device like an iPhone to be plugged in to charge. The proposed invention was first filed by Apple in May of 2010, and was made public this week. It is credited to Aleksandar Pance, Nicholas Alan Rundle, and John Douglas Field. The latest application is not the first time Apple has shown interest in redesigning its power adapters to allow charging of multiple devices. In September, another filing showed the company is interested in building a universal charger that would allow portable devices to not only recharge their batteries, but also sync data while plugged in to the same adapter.